Please Note: All readings and homework are due for the class under which they are listed. Students are expected to be ready to discuss the reading. For many of the readings there are study questions. Click on the title of the reading to go to the text and study questions, unless otherwise stated. (Some items will ONLY be available on reserve, so plan ahead.) If students do not wish to read or print from the web, the readings are all available in McKeldin Library Reserves. If you cannot find a reading either here or in the Reserves room, please contact Dr. Cooperman (bc40@umail.umd.edu) as soon as possible (not on the day of the class for which the reading is due). Don't forget to refer to this site often in order to stay up-to-date on changes to the schedule or assignments and the addition of study questions or extra credit opportunities. Finally, please remember the following University Honor Pledge which you should have written and signed on all of your assignments and exams: "I pledge on my honor that I have not given or received any unauthorized assistance on this assignment/exam." "Stadt ohne Juden" ("City Without Jews"; 1924). Dir. by Hans Karl Breslauer. Based on a novel of the same name by Hugo Bettauer. 80 minutes. Wed. Aug. 31 Introduction: The Urban Context of Jewish Historical Experience. The Goals of the Course. Moses Maimonides, The Guide for the Perplexed, trans. by Shlomo Pines (Chicago, 1963), Book III:51 ("The Parable of the Palace"). McK BM545.D33P5. Also useful for our discussion is Book II:40. "The Oldest Extant Constitution of a North American Jewish Community (1728)"
"Constitution and Charter of Rodeph Shalom, Philadelphia, 1810-1812"
Wed. Sept. 14 The Modern Period: New Patterns of Urbanization in Eastern Europe; Shtetl Dynamics and Urban "Ghettos"
"The Other Half Revisited: The Legacy of Jacob A. Riis" (1996). Dir. by Martin D. Toub. 60 minutes. V4046.N6 R75 1996. "New York City Free Loan Societies (1917)"
"Jewish Community Council of Essex County, New Jersey, 1945"
"The Greater Boston Area Jewish Ensemble, 1985"
"Charter of the Kehillah (Jewish Community) of New York City, April 5, 1914"
"Camden, New Jersey Combination Synagogue and Burial Society, 1894"
"Crossing Delancey" (1988). Dir. by Joan Micklin Silver. 97 minutes. PN1997.C777 1988. Wed. Oct. 5 ROSH HA-SHANA (Jewish New Year). No class. Deborah Dash Moore and David Lobenstine, "Photographing the Lower East Side: A Century's Work," in Remembering the Lower East Side: American Jewish Reflections (Bloomington: Indiana University Press, 2000), pp. 28–69. "Joshua, Then and Now" (1986). Dir. by Ted Kotcheff. 102 minutes. SHOWN IN CLASS. Wed. Oct. 19 Sukkot (Jewish Holy Day) No Class. "Angel Levine" (1970). Dir. by Harry Belafonte. 106 minutes. FILM SHOWN IN CLASS: "Nomi's Bat Mitzvah" (2000). Dir. by Jessica Sharzer. Wed. Oct. 26 Simhat Torah (Jewish Holy Day) No Class. Hana Wirth-Nesher, "Afterword: Between Mother Tongue and Native Language in Call It Sleep," pp. 443–462 in the 1991 edition of the novel. "Fires in the Mirror" (1993). Dir. by George C. Wolfe. Written and performed by Anna Deavere Smith. PNMI VHS Ref. 81. 82 minutes. Mon. Oct. 31 The Yizkor Bukh and the Invention of the Shtetl; When We Were Poor: the Invention of the "Good Old Days"
Philip Roth, Goodbye, Columbus (1959; Boston, 1989). McKeldin Reserves. Ref. PS3568.O855G6 1989. Note: This story is also on electronic reserve. Please ask the professor for the electronic reserves password if you do not know it. Maxine Rodburg, "The Law of Return" in The Law of Return (Pittsburgh, 1999): 9-36. McK. Reserves; PS3568.O3448L29. Note: This story is also on electronic reserve. Genesis 4, 11, 12, 13, 14, 15, 19, 23. Skim the chapters looking for images of the city. [There are further references in the books of Deuteronomy, Joshua, Judges, 2 Kings, and 1 Chronicles.] Find a copy of the Bible in the reference section of McKeldin Library. Nitza Rosovky, ed., City of the Great King: Jerusalem from David to the Present (Cambridge, MA., 1996): chapts. 1-2 (especially, 9-14 and 37-41), 3, and 7. This item is only available in McKeldin Library Reserves. Ref. DS109.9C58 1996. 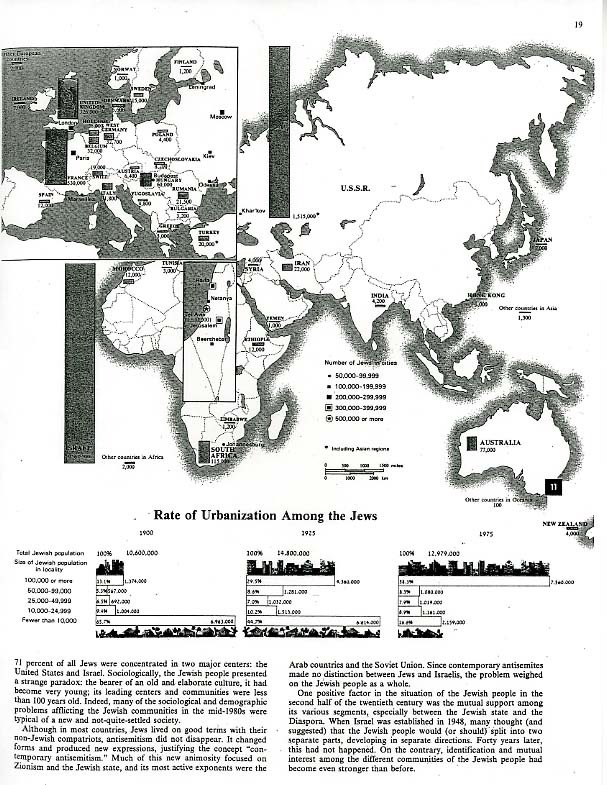 Moshe Weinfeld, "Jerusalem: A Political and Spiritual Capital" in Joan Goodnick Westenholz, ed., Capital Cities: Urban Planning and Spiritual Dimensions (Jerusalem, 1998): 15-40. McKeldin ref. DS41.5.C27. 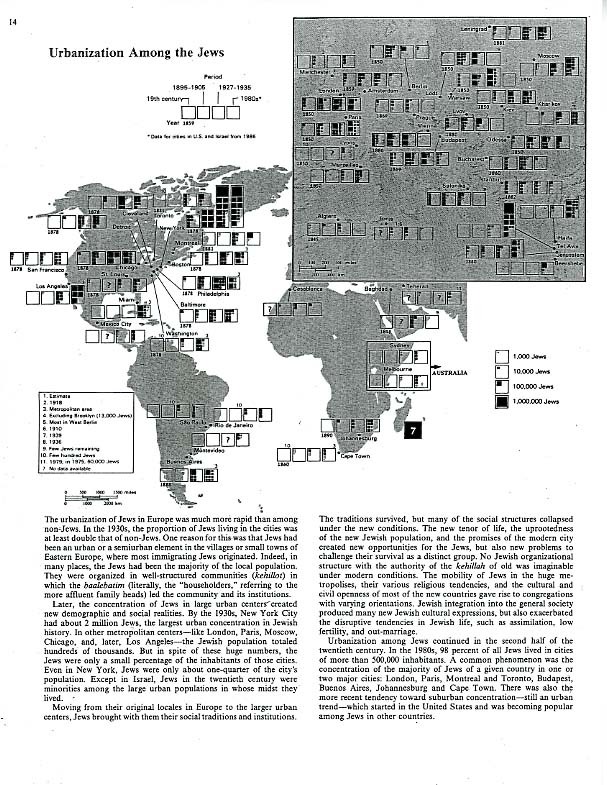 Carol Herselle Krinsky, Synagogues of Europe: Architecture, History, Meaning (New York, 1996): 59-93. Note: Be sure to look at the photographs of the synagogues referred to in the margins of the assigned pages. McKeldin reserves; ref. NA5450.K75 1996 FOLIO. This book is also available at the Hornbake Library Maryland Room. "In Satmar Custody" (2003). Directed by Nitzan Gilady. 70 minutes. "60 Minutes: Kiryas Joel" (1994). Anchored by Ed Bradley. 20 minutes. Edward W. Said, "Leaving Palestine" in The New York Review of Books (Sept. 23, 1999). See study questions. Amir Cheshin, et al., Separate and Unequal. The Inside Story of Israeli Rule in East Jerusalem. (Cambridge, MA. : Harvard University Press, 1999). McKeldin ref. DS109.94.C49 1999. This account of policy making on the part of the Israeli municipal government of Jerusalem provides useful background for your final paper. Sarah Kaminker, "For Arabs Only: Building Restrictions in East Jerusalem" in Journal of Palestine Studies 26:4 (Summer 1997): 5-16. McKeldin Reserves; ref. DS119.7.J63. The presentation of Israeli policy in this reading (as well as in the Cheshin book) have recently been challenged by a new study that you may also find useful: Justus Reid Weiner, Illegal Construction in Jerusalem: A Variation on an Alarming Global Phenomenon (Jerusalem: Jerusalem Center for Public Affairs, 2003), McK HD 9715.I72W45 2003 (on reserve). [REPEAT SHOWING FOR NON-GERMAN SPEAKERS] "Stadt ohne Juden" ("City Without Jews"; 1924). Dir. by Hans Karl Breslauer. Based on a novel of the same name by Hugo Bettauer. 80 minutes. Note: English inter-titles now available at the front desk at Hornbake. "Chronicle of a Jerusalem Courtyard." (2003). Dir. by Tom Barkai and Tzvika Nevo (Mann). 28 minutes. POSITION PAPER DUE AND EXCHANGED IN CLASS. POSITION PAPER CRITIQUE DUE IN CLASS. "Balance of Fear" (2002). Dir. by Paul Loughlin and Brendan O'Brien. 49 minutes. "Wailing Walls" (2002). Dir. by Tor Ben-Mayor and Yehuda Litani. 49 minutes. Wed., Dec. 21 Final Examination due in Dr. Cooperman's office by 10:00 a.m.